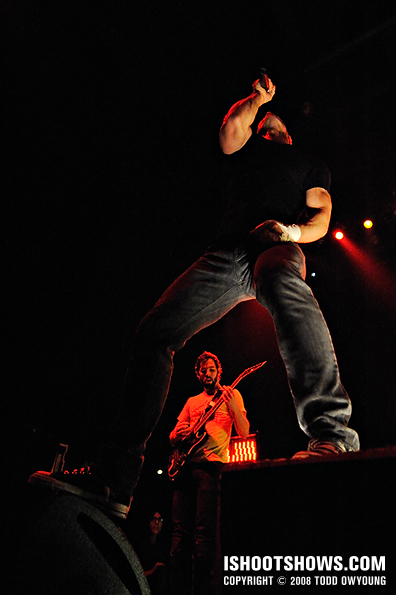 Greg Puciato and the rest of The Dillinger Escape Plan take the stage calmly enough, but seconds into their set, we're being crushed by an assault of hyper-technical riffs, complex time-signatures, and the end-is-here urgency of the hulking frontman's vehement vocals. 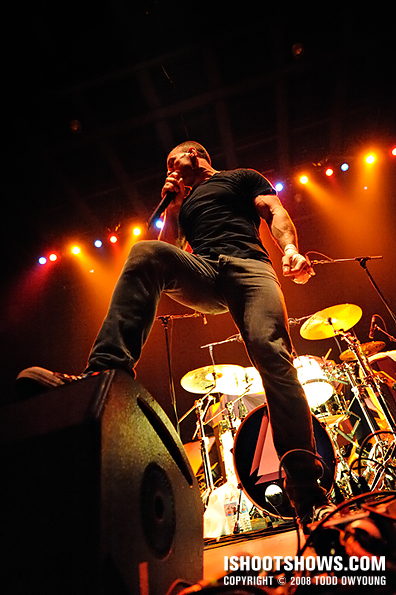 In a concert featuring three metalcore bands, the super-technical performance of Dillinger Escape Plan was easily the most brutal in a set combining an explosive degree of physical recklessness with raw musical ability. 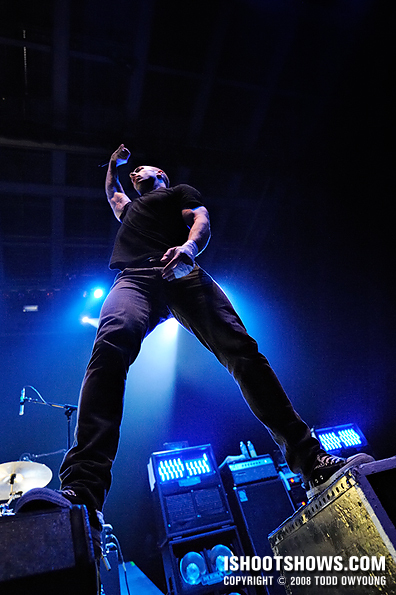 Between Ben Weinman‘s meticulous speed riffing, new drummer Gil Sharone‘s mechanical exactitude, and Puciato's savage vocal delivery, TDEP's live show was an utterly visceral experience that ranks among the most raw and frenetic I've seen. This is definitely one of the most challenging sets I've photographed by virtue of the sheer activity on stage. 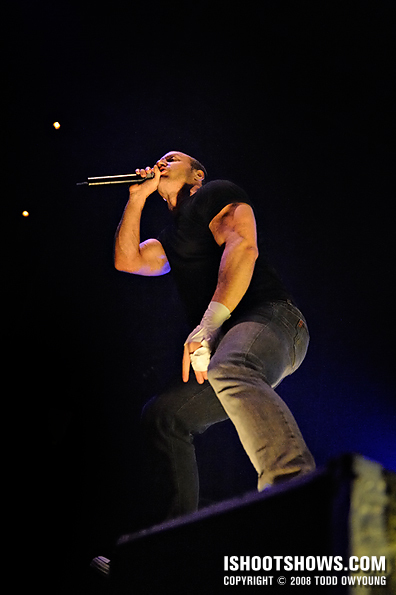 At the front of the chaos was singer Greg Puciato, whose intimidating physical frame seamed to spring across the stage in a series of contortions and lunges. 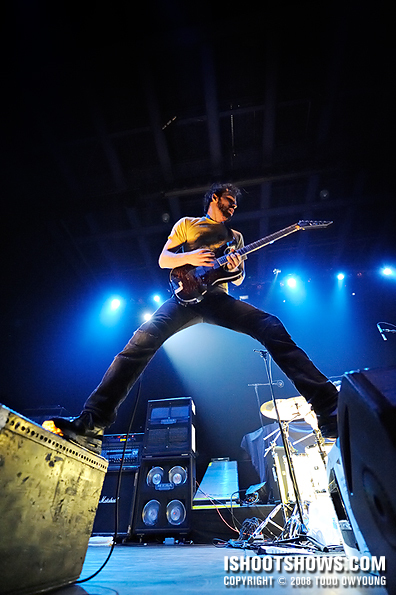 Guitarist Ben Weinman provided an equal amount of activity and presence, playing at the front of the stage and getting air with guitar kicks with every opportunity he could. If anything, this performance seemed to compound the two critical constraints of concert photography: low light and fast action. Coming back after the show, I was somewhat surprised by the number of images, few as they were, that turned out from the set. 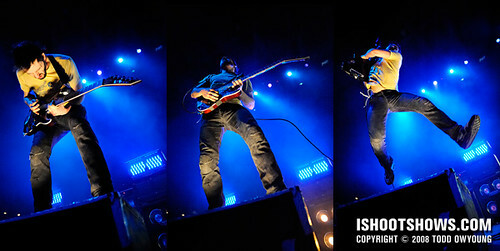 This performance was photographed from a wide pit with three other photographers and several security personnel. Lighting for the first three songs was almost entirely made of up of dim blue backlighting, accented by a set of three illuminating platforms at the front of the stage. 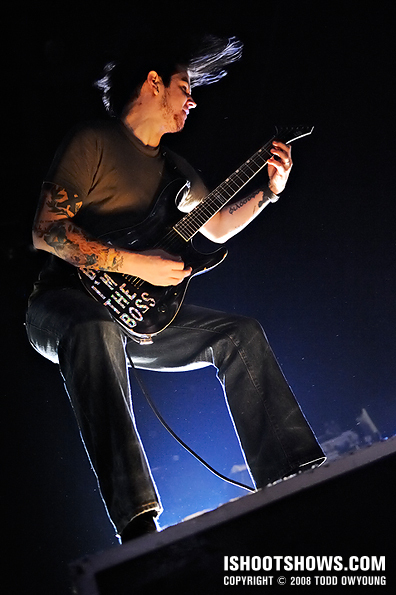 These box platforms featured warm-white under-lighting and were similar to what other bands like Bleeding Through and Avenged Sevenfold have used in the past. The main challenge of these stage-planted light sources is that, of course, illumination depends entirely on the subject's placement directly above them. 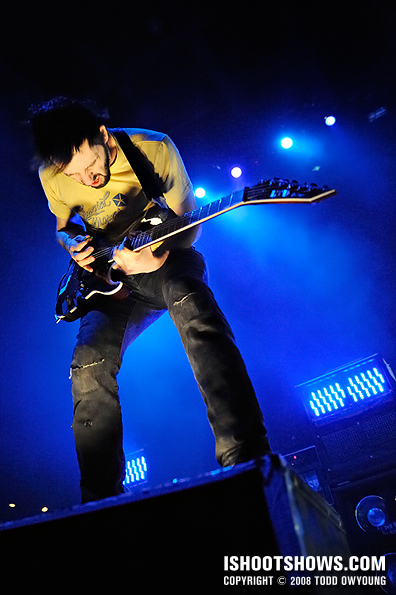 Under more conventional shooting circumstances a band like TDEP would be difficult enough to photograph, but the challenge of static light sources made such active subjects all the more challenging. Luckily, Puciato and Weinman performed a fair amount on the light boxes, even if much of this occupation took the form of spastic bouts of musical chairs that saw the two switching off and in constant motion. In addition to the backlighting and light boxes, the band had two crate-like lighting rigs in their speaker stacks that features four lights each, which flared up and provided some hot white light periodically throughout the set. 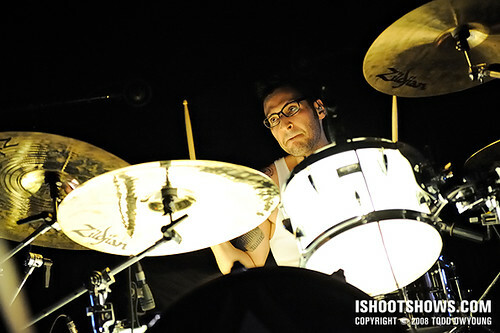 Sharone's entire drumkit was rigged with internal lighting, so the drum heads glowed a hot white and provided varying degrees of illumination for the drummer. I used the Nikon 24-70mm f/2.8 and the Nikon 14-24mm f/28 for this set. 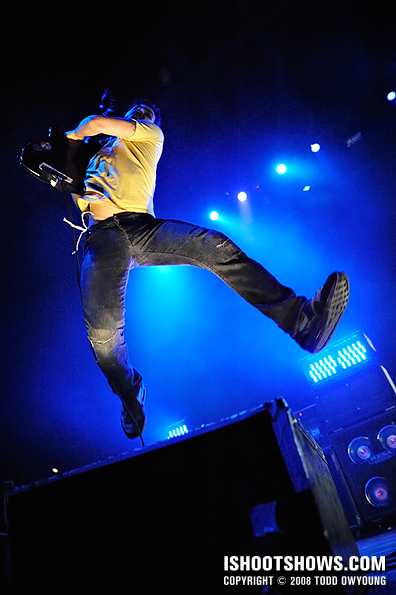 The wide angle of both lenses was especially for dealing with the high activity and unpredictable movements on stage. I used 70mm a few times to pick up drummer Gil Sharone (who is destroyed it, by the way), but beyond that, I mostly shot below 32mm. For this set, I shot between ISO 6400 and ISO 8000, with shutter speeds between 1/160 and 1/320 at f/2.8. If I were shooting these guys again, I'd cranked up the shutter speeds even more and go up to HI-1 (ISO 12800) to squeeze out a little more freezing power. To be honest, this is one performance that had me shaking my head. Not about the raw assault on my eardrums, but for the sheer technical difficulty of the shoot. To anyone shooting these guys on the current tour, good luck. 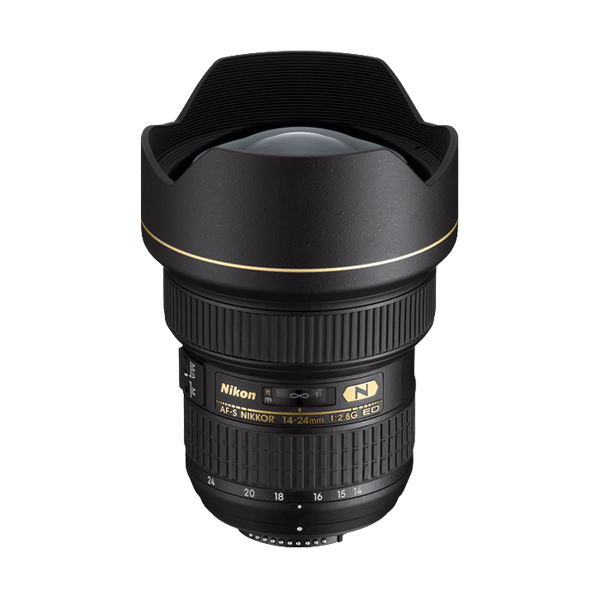 iso6400-8000?? damn.. any chance of an unprocessed shot because i can’t believe how clean everything is!!! Hey Dude, the permissions are busted on the header pic. I didn’t have a chance to read the writeup, but this looks brutal to shoot. Yeah, I’ve been shooting most of my recent work around ISO 3200, but ISO 6400 is still super clean as long as it doesn’t need to be pushed. I’ll see if I can send you a crop or maybe I’ll just post it here. One thing I’ve noticed with the D3 is that it has a really tight noise pattern. The noise is almost entirely luminance-based, so if anything, there’s just a fine grit to the images at high ISO. The most interesting part is that this fine noise disappears for the most part when the images are downsized. With the D2x, the noise signature was much more clumpy, so smaller resolution files still showed those artifacts. Yeah, another victim of Flickr permissions. This show was completely brutal. TDEP was crushing us into the dust with the math. I hope the shooting notes help if you’re photographing these guys. I think it would be really interesting to photograph these guys in a smaller venue with a lower stage. The D3 has been a miracle camera for me, coming from the Nikon D2x, which was easily the single worst pro cam for high ISO work in its day. Absolutely incredible. I always knew you were an artist to watch for in the future, but you never cease to impress me. I remember seeing you with your camera in the Duck Room a few years ago for the Spin Doctors concert, and I’m really very glad that it’s blossomed into a budding concert photography career (or is this still more of a hobby?). I just found out about your gallery showing at the Pageant, and I can’t wait to go see it. Unfortunately, I’m traveling out of country for the next week, so I’ll have to catch it on one of the last nights of the show. Good to see you’re doing so well. 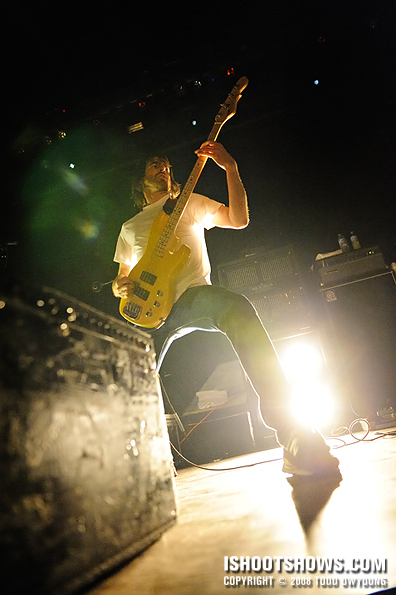 PS – In this set, my favorite picture is the one of the bassist with the monitor blocked in the lower left and the backlight behind his left leg. Pretty much all the Dresden Dolls shots were awesome; I’m sad I ended up not going to that show. Good to hear from you, it’s funny that you should mention when we saw each other in the Duckroom, I was just thinking about that a few days ago and wondering what you were up to. Let me know when you’re going to stop by the Pageant for the show, I’d be happy to meet up with you and give you a walkthrough of the images. Thanks for your pick in this set. The Dresden Dolls show was great, as their performances always are, and of course it was all eye candy as a photographer. See you soon, hope you’re well. the last shot is really incredible! Great Work! Hey, Peter. It’s my favorite out of the set, too. Thanks for the pick. no fire breathing at this show i guess, eh? Jason, not this show. Only metaphorical fire breathing this time.